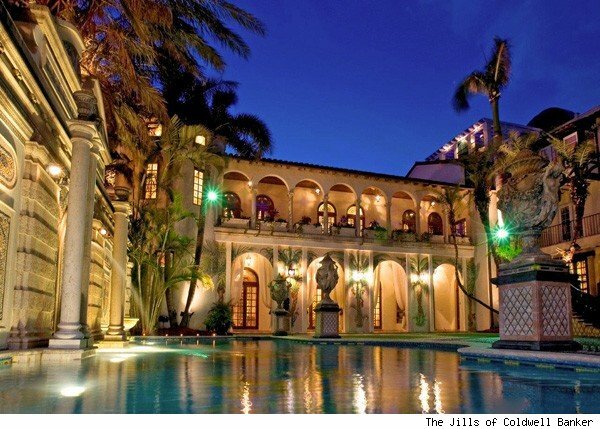 Talk about living in style: Casa Casuarina, the former home of the late fashion designer Gianni Versace, has just hit the market for a whopping $125 million. Though the price tag may seem unnaturally steep to most, for this level of luxury real estate, it's no surprise. The world famous home, built in Miami Beach in 1930, sprawls across 19,000 square feet. It features 10 bedrooms, 11 bathrooms, a 54-foot-long pool lined in 24-karat gold and ornate, Medusa-emblazoned front gates (the same gates at which Versace was fatally shot in 1997). "This is not only the most well-known property on South Beach," says listing agent Jill Eber of Coldwell Banker, "it's also known worldwide for its attention to detail throughout every room, its elegance and its style." Its link to one of the world's most iconic fashion designers probably doesn't hurt, either. Versace bought the home and its adjacent lot in 1992 for just under $10 million, and then invested another $33 million in the property. The haute couture designer added a 6,100-square-foot south wing, a mosaic-covered courtyard, frescoes on the home's walls and ceilings, and the aforementioned gold-lined pool. Three years after Versace's death, telecom entrepreneur Peter Loftin purchased the property for $20 million and turned it into a luxury boutique hotel with restaurant. The multi-million-dollar listing joins a slew of former homes of late celebrities currently on the market, including Michael Jackson's California chateau, Beatle George Harrison's Swiss manor and Amy Winehouse's London apartment.